Spring brought us unseasonably warm weather in April and May with a little dip in June. In early July we have a steady stream of hot days so we find ourselves sunning on the beach regularly. 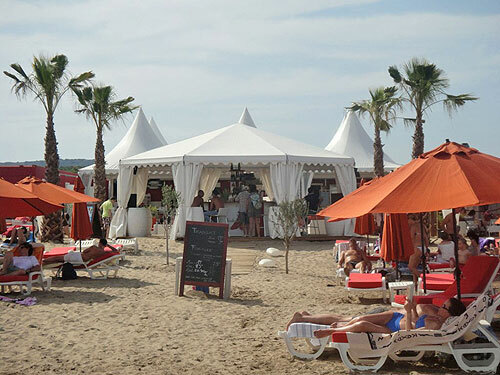 On Narbonne Plage we are surprised to find a new restaurant located directly on the sand in front of the surf. We almost have to rub our eyes in disbelief as it is an enormous confection of white tents and red umbrellas - rather as we might imagine a mirage in the desert. It is called La Voile Rouge, and we wasted no time checking it out. Our first visit we enjoy frosty glasses of chardonnay in the bright sun, lounging on foamy chairs in full view of the sea. Not bad, rather like a swank Miami Beach. The second visit they are still setting up the restaurant so we had to come back a week later for a proper meal. We return on a Monday evening to find the place filled to the brim, every seat taken and looking like it has been in business for years. My entrée of oysters in a cream sauce is lovely, and we all marvel at the towers of shellfish that many customers are enjoying. The establishment marks a milestone in Narbonne Plage's image, bringing it up a notch from the regular cantines of moules frites. In front of the resto there are lounge chairs for rent for a tony 13 euros a day. Take a look at the photo and you may have to agree that la vie est belle, n'est-ce pas? In addition to our new beach place, we have more great news to announce: in Narbonne city center McDonald's fast food restaurant has closed and left for good having been replaced by a classic French brasserie called Le Cristal! Gone are the big photos of Big Mac, the endless swarm of ados, and the accompanying poubelle. Now we have a lovely sea of sparkling wine glasses set on elegant tables and a crowd of varying peoples all excitedly enjoying the graceful cover of the tall platane trees and the beautiful balustrades of les barques. Again on a Monday - Narbonne is usually closed up on Mondays - we visit Le Cristal with four out-of-town visitors. The remarkably well trained staff brings us crispy grilled meats, luscious salads, chilled carafes of wine and café gourmands. People are eyeing each other, there is abundant laughter in the air and the feeling is ubiquitous: Narbonne is developing a more cosmopolitan atmosphere with this new big-city type brasserie à la Aix-en-Provence or even Paris. We started the evening a little concerned that it was too soon to test the new resto and ended up walking away very pleased we had done so. Besides the new restos we also have plenty of friendly barbecues to enjoy. One of our signature dishes is a round of brie or camembert put on the barbecue still inside its wooden box. The top of the cheese is sliced with an 'x' that is opened and some pesto or eau de vie is sprinkled inside. As the cheese melts, it absorbs the ingredients sprinkled within and becomes a delicious fondue that we dip bread into. In La Clape, an enormous nature reserve next to the beach, there are dozens of picnic spots nestled in the trees where we bask outdoors undisturbed while cooking a delicious lunch. Escape to La Clape is particularly handy when the wind is blowing too hard to sit on the beach – unless you enjoy getting sand blasted. The shielded picnic areas provide enough sun to get bronzed, and we are mollified by the alternative to sand and sea. Port La Nautique is also an idyllic spot for outdoor cooking and gatherings. We attend a party for a large group of expats there, all of us joined by our French teacher who organizes the barbecue. The warm weather brings people together, and we are happy to be living here, especially when the rest of France is experiencing a lot of unseasonal rain and lower-than-normal temperatures this summer. Even the Côte d’Azur has had more than its share of rain this year. So, now in the heat of the summer, we have regular treats of music. For a week before Bastille Day there is drum music, singing and colorfully-dressed groups of dancers throughout town. Some of them resemble whirling dervishes! 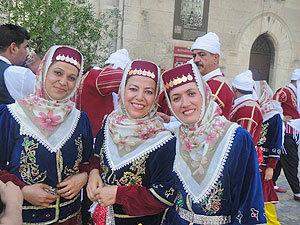 It is an impromptu festival of Arabian music. In the Place de la Mairie I manage to get a photo of three very glamorous ladies in their finest garb with smiles that could melt the North Pole. Also in the Place de la Mairie they have put up the new schedule for the summer's festivities called Tempos d'Été or Rhythms of Summer. Fête de la Musique is June 21, the Summer Solstice which is celebrated all over Europe. During this night the French have what they call une nuit blanche, which means they stay up all night until dawn. The anticipation is palpable and dozens of bands line both sides of the canal. The city has also closed off our street and Le Place des Jacobins right in front of the building. A cool bossa nova jazz band sets up and starts cranking out very seductive Brazilian music that is impossible to ignore - being right outside our windows - so we are transported to the celebrations and last for hours going from band to band enjoying a wide variety of songs. We particularly like a bluegrass band that plays incredibly good banjo and guitar. The singing is also terrific except for one minor and endearing flaw – ze French accent! Hearing these American folk songs sung so beautifully with a French accent just makes me smile. 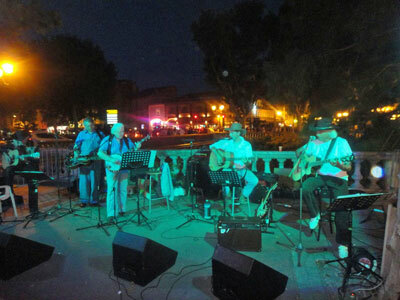 There is an enormous love of American country music here in Narbonne, and we see several bands that play acoustic music à la USA. Of course there are lots of French folk singers, Spanish Flamenco performers and traditional French torch songs that had been made famous by Edith Piaf, Charles Trenet and Charles Aznavour among others. Friends in Toulouse sadly reported that they had little more than DJ music in their streets, but I am proud to say Narbonne was a true festival of live musicians. Although the Fête de la Musique is supposed to last all night, it hasn't done so for the past two years due to – rain. Around 12:30 AM the raindrops begin to fall and the music stops completely by 1 AM. However, I'm sure that the Narbonne cleanup crew doesn't mind. At the end of every festival they come out in force, by the dozens, and the mess is gone before the next day's breakfast baguette seekers are hitting the pavement. Our little chambre d'hotes is in full swing with travelers making our 300-year old porte d'entrée look like a revolving door. This year's guests come from a wide variety of countries and have varying personalities to match. Early in June we have serious American hikers who manage to walk from our city center down the canal chemin d'halage to Port Nouvelle and back, a 35 kilometer round trip. Not bad for one day. Next there are university professors from Australia here to hire a canal boat followed by Canadian cyclists who arrived from Carcassonne on bicycle which is is a half hour by car - about 65 kilometers away. After these serious trekkers we get a couple from Aberdeen, Scotland on their honeymoon, a Swiss couple on their babymoon, a geologist and then a priest who stays to preside over a wedding. An ex-Foreign Legionnaire searching for his comrades adds intrigue to our mix of guests. There are also property seekers sprinkled in the group, people either looking for a second home in southern France or an investment. Buying and selling properties in different parts of the world has been my passion for many years so I can't help myself from looking at interesting places available just for curiosity's sake. This brings me to pay a visit to a château right on the edge of Narbonne, along the Canal de la Robine. Château Mandirac used to be a wine domaine but is now a private home nestled in the Narbonnais paysage. It has a fascinating history. Around the end of the 19th century the French winemakers experienced a devastating plague on their vines. The phylloxera bug brought down most vignerons in France, and many people were ruined. Anyone who could produce wine made a fortune as the price went skyrocketing due to the great scarcity. However, some of the producers along the Canal de la Robine were able to literally drown the bugs by flooding their fields with water from the canal. They became the nouveau riche of the region, and about a dozen of them used their new-found wealth to build châteaus. Château Mandirac is one of these. 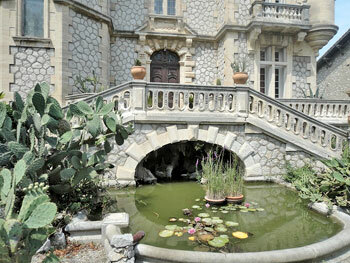 It is a classic château with large gardens, a small grotto, curving staircases and colorful tiled floors. It has turrets and marble fireplaces and stained glass windows. All the things one might expect from a château. I particularly like the size as it isn't enormous, just big enough for a modern family to enjoy without being slaves to the upkeep. The owners have lived in it for 13 years and are moving into another château in Narbonne that they will renovate to suit their lifestyle with grown children. It is selling for over one million euros. The photos show a little of its charm and beauty. Places such as Château Mandirac are known as patrimoine in France. Patrimoine means 'heritage', and the French certainly have plenty of it. While Narbonne has its share, it could have had much more than it does as it used to be a walled city. For some reason the wall was painstakingly demolished over a period of three years in the late 19th century along with several Roman temples. The walls were six meters high in some places and around three feet thick. The stones were carved and portals opened to the roads which led to various nearby cities: Beziers, Perpignan, Carcassonne, etc. 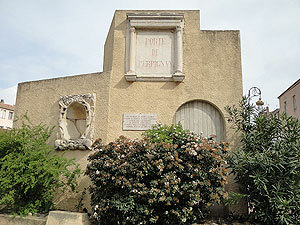 A vestige still remains of the Porte de Perpignan along with its decorative niches. Around 2,000 of the ornate stones have been preserved in the Musée Lapidaire in the gothic church of Notre-Dame de Lamourguier. There you can see bas-reliefs, columns, corner stones and statues. 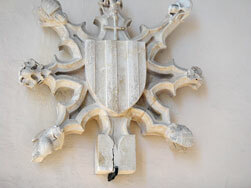 After the collections in Rome, it is one of the most important collections of decorative stones in the world. Patrimoine is also very visible in the buildings actively in use today. 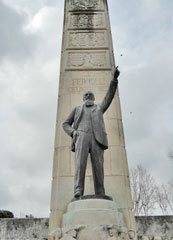 I took a few photos of sculptures and masonry for an idea of Narbonne's patrimoine. 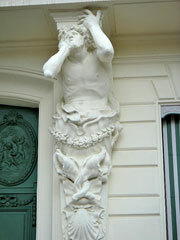 On Rue Jean Jaurès near the Place de la Mairie muscled Roman men hold up a balcony on a recently renovated hotel – their faces are contorted in anguish. Whether it is from their Atlas strain or a more esoteric pain is unclear. 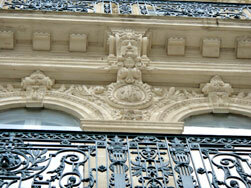 The building is beautiful with an enormous carved double door set with cast iron half-moon grilles. An engraving says it was built in the 17th century. 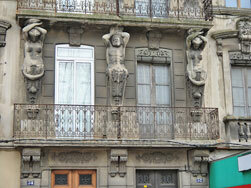 Another building shows a Poseidon type of character flanked by two Minervas. It hasn't been cleaned in a while, but the figures still show good detail. The good Docteur Ferroul is a hero in Narbonne, having led the revolt of the vignerons about 100 years ago, and his image is immortalized next to the Palais de Travaille a classic example of Art Déco architecture. Mysterious heads above curved doorways frequently decorate many entryways in Narbonne. I took photos of some of the better preserved ones. Bearded men are popular as you can see from the photos. The Occitan cross is also found everywhere and comes in many styles - there is one just outside the Museum of Contemporary Art. In the Salon des Consuls, located in the Place de la Mairie, there is a wonderful brass wall sculpture that I like the most. 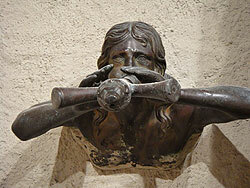 A figure comes straight out of the wall, blowing a trumpet in a siren call from the Aude River. Water figures are popular in Narbonne's patrimoine. Perhaps because the river used to run through the city, water made it an important trading center before the River Aude silted in and the galleon ships could no longer sail into the city center. Nostradamus in Century 3, Quatrain 88 predicted Narbonne's population would reach one million. Interesting that he didn't foresee the silting of the Aude. July in France brings us two of the biggest annual events in the country: Bastille Day and the Tour de France. The Tour captures our attention for three weeks and, as they normally pass through the Languedoc-Roussillon, we usually go to see them at some point. This year we went to the small village of Aigues-Vives. The weather was actually chilly and a little overcast. Having brought a picnic we decide to get a bottle of red wine to go along with the food and warm us up a little. Thus we walk into a small grocery store laden with several shelves of locally produced wines. I choose a deep ruby Grenache and ask the clerk if it is one she would recommend. She replies she doesn't drink wine but that the maker is the mayor of Aigues-Vives. The manager and a customer tell us the same thing with their classic French shrugs. They know who makes the wine, but haven't tasted the wine themselves. Who knows? Well, we bought it and can say it went well with the food. Back to the Tour, we settle in our beach chairs to have lunch and people watch. The crowd starts assembling at noon and swells to full size, a few hundred, around 2 PM. Two to three hours for about sixty seconds of thrill. First la caravane zooms by. It includes a baguette covered car promoting a bakery, trucks of Vittel water sprayers, Carrefour disco dancers throwing out red, white and blue polka dot hats matching the shirts on the cyclists, Haribo candy makers tossing out chewy samples of jelly beans, and a tire sponsor with enormous statues of cyclists that bear down on the crowd below it as it races through the street at around 65 miles per hour. Once in a while a truck halts to sell the crowd official Tour souvenirs which all bear the bright yellow color of the winning jersey. I still have my yellow umbrella from three Tours ago. 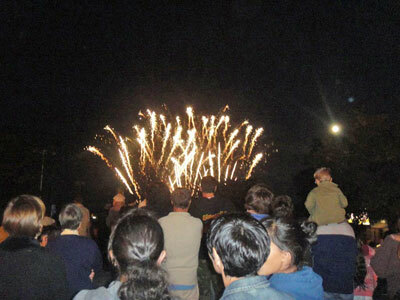 Bastille Day is always exciting and this year was no exception. The City of Narbonne does a good job in setting up impressive fireworks at the Parc d'Exposition. Thousands of Narbonnais and tourists alike make the ten minute walk from city center to ooh and aah at the 15 minute fireworks display. July is a hard month to match for excitement but August will outdo July with the Charles Trenet Festival, Les Jours d'Antan and many other events. The tourists are swelling the town numbers more than ever, and there is hardly any French heard in the streets as tourists are always talking to each other, shouting to their children or looking at menus and talking about the various dishes on offer. English, German and Spanish are the most popular languages but I am hearing a lot more Scandinavian and seeing more Japanese this year than last year. A new Forester hotel resort is being built on the canal de La Robine just on the edge of town. The little electric rental boats are buzzing up and down the canal next to the large hire boats that float lazily toward the next lock, their occupants sampling some of the local rosé. A couple of impressive private yachts have decided to stay awhile and, as ex-boat owners, we can't help but drool a little bit over their pristine decks. The City of Narbonne is planning a massive multi-million euro overhaul on our side of the Canal de la Robine, la rive droite, to make it more pedestrian friendly and accessible to the public. It looks just fine to me now, but the future is beckoning for more glamour and fun. They are anticipating nothing less than total success and so am I. Recently we attended a grand degustation at a restaurant called Les Souquets that is nestled in the heart of La Clape, Narbonne's pristine reserve of nature. Surrounded by cliffs and trees we tried some excellent, and unusual, local wines. The tasting was hosted by our friend Charles Husson, a professional vendor and connoisseur of wines of our region. Two white wines stood out among the others. What was very special about these wines is they are 100% Bourboulenc, which is a very old varietal and rumored to have Greek origins. It's normally used for blending but Domaine de Simonet's Christophe Barbier gives the Bourboulenc it's own spotlight with 100% Bourboulenc wines that are very impressive without the usual pretentious prices. This is especially interesting as it is also classified as a 'Bio Wine' which is the French equivalent of 'Organic Wine'. The Domaine de Simonet 2008 Bourboulenc blanc, is clean crisp and unoaked. It is a great all around wine for any occasion and doesn't need a particular food group to blossom on your pallet. A bottle retails for €6.90. The second wine is Domaine de Simonet's 2006 Les Terres Salées blanc, again 100% Bourboulenc aged in oak for six months. It is a deeper white with flowery nose, nice acidity and lovely vanilla finish that is often found in well oaked wines. It retails for €12.50 a bottle. As members of a wine club we can get a 20% discount which makes these very reasonably priced yet fabulous wines. 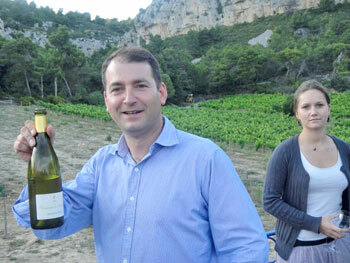 Domaine de Simonet is a small domaine in La Clape near Narbonne next to the sea. The wine gets its unusual flavor from the salty earth that is often "spritzed" by Mediterranean sea due to the famous high winds of the area. 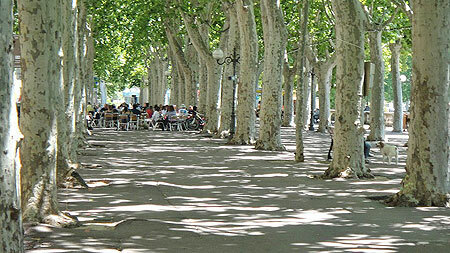 Platane – a tree most common in France along the Canal du Midi, Narbonne and in Provence - known as sycamores in North American and plane trees in England. La rive droite – the right bank as opposed to la rive gauche which means the left bank of a river or canal. Les Souquets – old vine branches that have been dried out and are used for grilling food. La Clape – Occitan for 'pile of stones'. [Photo credits: Marlane O'Neill 2011. All rights reserved.